In Your Enduring Don’t Let Your Love Grow Cold! “And because lawlessness will abound, the love of many will grow cold. 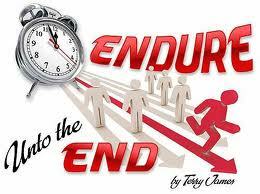 But he who endures to the end shall be saved.” Matthew 24:12,13. Endures, hupomeno; Strong’s #5278. To hold one’s ground in all conflicts, to stand up to all adversity, hold out under the heavy hand of stress, to persevere under daily pressures, to wait in God’s peace calmly and courageously. It is not passive resignation to fate and mere patience, but the active, energetic resistance to defeat that allows calm and brave endurance. There will be religious deception, social and political upheavals, natural calamities, disloyalty, and persecution—all of which are precursors of the end times. In the midst of all the difficulties, the Lord’s followers are to persevere in spreading the gospel. So much of what Jesus said in Matt. 24 is happening and appears about to occur. The word endurance would fit nicely in the fruits of the spirit. I think it is much like long-suffering (patience). Your last paragraph is descriptive of the times we are in. Thank you Chris. We all benefit from a Word shared.